Ambassador Richard Kenneth Fox served as U.S. Ambassador to Trinidad and Tobago during the Jimmy Carter Administration. Fox was born on October 22, 1925 in Cincinnati, Ohio. After a stint in the U.S. Navy from 1944 to 1946, he enrolled at Indiana University and received his Bachelor of Arts degree in journalism from that institution in 1950. Two years later, in 1952, he earned his graduate degree in social psychology from Indiana University. 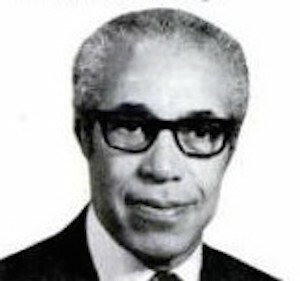 Fox had hoped to pursue a career as a reporter at a major newspaper but given the racial discrimination in the early 1950s he changed his career path and worked instead with civil rights groups such as Minnesota Fair Employment League and the Urban League in Minneapolis, Minnesota. While at the Urban League he began to acquire an interest in foreign affairs and international issues. Eventually he met Carl T. Rowan who was then one of the few black columnists with a major newspaper. With Rowan’s encouragement, Fox in 1961 joined the U.S. Foreign Service. His first overseas assignment came in 1965 when he joined the U.S. Embassy staff in Madrid, Spain. Returning to the United States in 1970, he became Executive Director of The Bureau of Educational and Cultural Affairs in the U.S State Department. In 1973, he became Deputy Assistant Secretary in that agency. The following year, in 1974, Fox was named Deputy Director of Personnel for Career Counseling and Assignments in the State Department. Three years later, in 1977, 52 year-old Fox was nominated by President Jimmy Carter to be U.S. Ambassador to the West Indian island nation of Trinidad and Tobago. After U.S. Senate confirmation, Fox arrived in the capital, Port-of-Spain, to lead the U.S. Embassy. Fox remained in Port-of-Spain until 1981. He returned to the United States and in 1984 he was named Senior Deputy Inspector General for State Department, one of the most prestigious posts in the Foreign Service. Fox retired later in 1984. Upon his retirement from the State Department in 1984, he was awarded the Wilbur J. Carr award for distinguished service. Since that time Ambassador Fox has served on the board of a number of national organizations including the Wheat Ridge Foundation, the Lutheran Human Relations Association of America and the Vesper Society. He is also a member of the American Academy of Diplomacy and the former Vice President of the Meridian International Center, a non-partisan, non-profit public diplomacy agency located in Washington, D.C. which works with U.S. government agencies and international organizations to promote international understanding. “Ambassador Richard Fox,” The American Academy of Diplomacy, August 17, 2009, http://www.academyofdiplomacy.org/; Frank Thompson, Public Papers of the Presidents of the United States, Jimmy Carter (Washington, D.C., Government Printing Office, 1978). (Washington, D.C., Government Printing Office, 1978).